We are very pleased to offer a range of subsidied transport options and facilities to assist Winchester School of Art (WSA) students in accessing facilities and amenities in both Winchester and Southampton. The University of Southampton now has adequate halls accommodation in Winchester (Erasmus Park and Riverside Way) to accommodate WSA students requiring University accommodation in Winchester. Any WSA students who choose to live in University accommodation in Southampton receive a bus pass for the Unilink bus service included in their hall fees, including WSA students. As Unilink does not have a bus service between Southampton and Winchester students living in University accommodation in Winchester (Eramus Park and Riverside Way) receive a reduction in their hall fees to assist them in using the bus or train on the occasions they need to visit Southampton. For 2018-19 this reduction is approximately £287, compared to other University accommodation. All WSA students can purchase a Bluestar bus pass which has been discounted by Bluestar and subsidised by the Faculty. A termly (90-day) bus pass can be purchased from the Finance Office at WSA or the Unilink Office, located above the Students Union shop on Highfield campus. For 2018-19 the cost of the termly 90 day pass is £130. For supplementary ad-hoc journeys the Faculty is continuing to fund for 2018-19, a free shuttlebus service for WSA students between the Highfield campus, Southampton, and the Winchester campus, helping WSA students make the most of everything that Southampton has to offer. The 44-seat bus operates an hourly service during term-time and also stops at Erasmus Park/Riverside Way in the evening. Full details can be found on the WSA Shuttle Bus tab below. Further information can be found on the University's transport page. Due to incident on the M3, this afternoon/evening services are delayed. We are doing the best that we can to maintain schedules. Due to severe weather conditions the service has been suspended this evening. Apologies for any inconvenience this may cause. The information below will assist further in allowing you to travel easily between sites. 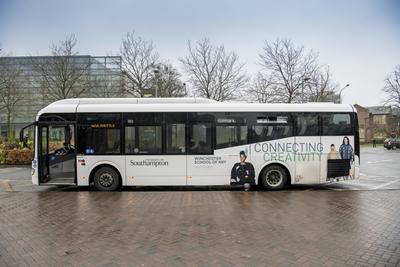 The University has arranged a free shuttle bus service for its students connecting the Winchester School of Art and Highfield, Southampton campuses. The service will operate to the following schedule. Please note times are approximate and notice of delays (over 15 minutes) and other problems will be announced on Twitter @wsashuttle. You can also track the bus live here. Students are required to present a valid Student Card to travel. The bus is wheelchair accessible. The University of Southampton Winchester campus is a 10 minute walk from Winchester Railway station. Five trains an hour operate between Winchester and Southampton, with a journey time of 10-15 minutes. Trains can be boarded from both Southampton Central and Southampton Airport Parkway stations. The Unilink U1 services provides a direct link between Southampton Airport Parkway and the Highfield Campus. For details of train departure and arrival times, please visit the National Rail website. For details of Unilink bus connections and tickets, please visit the Unilink website. Bicycles can be carried on South West Train services, providing an alternative option for onward travel. Students are eligible to apply for a Student Railcard, entitling them to a 1/3 discount on rail travel. The Bluestar 1 bus service runs between Southampton City Centre and Winchester City Centre at a 15 minute frequency, travelling via Otterbourne and Chandlers Ford, with a journey time of approximately 40 minutes. The bus stop at the Avenue/Burgess Road junction is the closest to the Highfield campus. The same bus stop is served by the Unilink U6 service, allowing for cross-service travel from Wessex Lane halls and Highfield. For details of the Bluestar 1 service please visit the Bluestar website. All Unilink and Bluestar services are equipped with wifi.